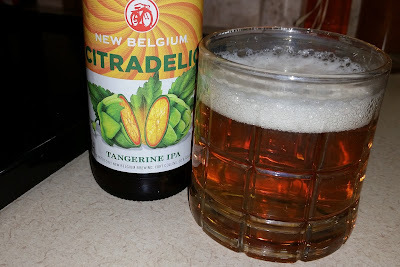 New Belgium Citradelic - AoM: Beer et al. The beer smelled like orange juice, it was a wonderful smell. It was hoppy, but not bitter like the IPA, Surly Furious, I had the other day. Actually, the beer's smell reminded me of some sort of fruit juice containing mango (e.g., Tropicana mango). *I was surprised to learn today (20160915) that it's "Brussels sprouts" and not "brussel sprouts." One article cites using a lower case 'b' is appropriate, due to the vegetable being so common and now removed from its association with the city of Brussels. Tune in and hop out with New Belgium Citradelic. Set adrift on a kaleidoscopic wave of hoppiness brought to you by a mystical marriage of Citra hops and tangerine peel, which elevates each sip onto a plane of pure tropical, fruity pleasure. Citradelic’s namesake hop and fruit combine to jam with visions of additional hops like citrusy Mandarina Bavaria, tropical Azzaca, and fruity Galaxy for a colorful explosion that’s grounded by just a touch of malty sweetness. Bored by the status quo? 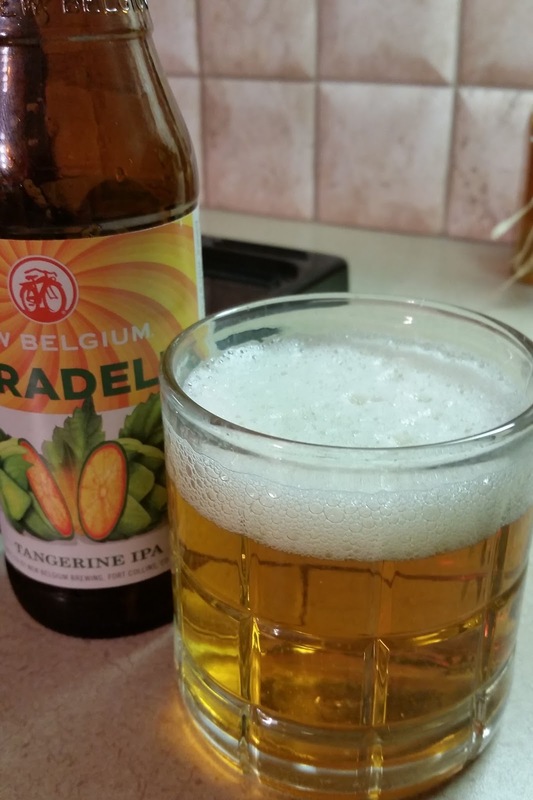 Expand your palate with a pour of Citradelic. Launching January 2016. VISUAL Bright golden orange in color with a light sheen. AROMA A blend of citrus (orange fruit/candy), tropical fruit (pineapple), and pine hop up front. Lighter are the herbal and caramel notes. FLAVOR Starts mildly sweet and transitions to a well-balanced bitterness. MOUTHFEEL Smooth start, lightly dry and a clean finish.